Warner Bros. has announced that DC's LEGENDS OF TOMORROW season 2 disc set hits shelves August 15. Read on for what's included in the disc-set including bonus features after the jump. Read the full press release below and pre-order season 2 on Amazon right here. BURBANK, CA (May 16, 2017) - Their time is now! Just before their third season premiere on The CW, Warner Bros. Home Entertainment releases DC's Legends of Tomorrow: The Complete Second Season on Blu-ray and DVD on August 15, 2017. Fans can zoom through 17 exhilarating episodes from the second season, plus exciting special features including the show's 2016 Comic-Con Panel, crossover featurette, gag-reel and deleted scenes. DC's Legends of Tomorrow is The CW's #4 show among Total Viewers, with over 3.2 million viewers tuning in weekly (Source: Nielsen National TV View L+7 US AA%; excluding repeats, specials, and <3 TCs; Season To-Date = 10/13/16-12/08/16). 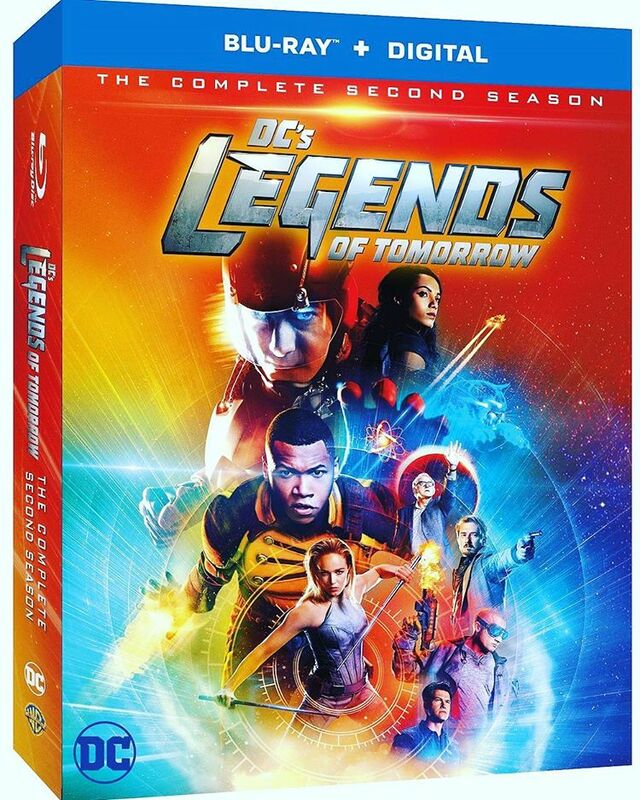 DC's Legends of Tomorrow: The Complete Second Season is priced to own at $39.99 SRP for the DVD and $44.98 SRP for the Blu-ray, which includes a Digital Copy. "DC's Legends of Tomorrow has captivated audiences through its incredible action and impressive special effects," said Rosemary Markson, WBHEG Senior Vice President, TV Marketing. "We're thrilled to release The Complete Second Season on Blu-ray and DVD to give fans even more of the excitement and adventure that they crave from this series." With Blu-ray's unsurpassed picture and sound, DC's Legends of Tomorrow: The Complete Second Season Blu-ray release will include 1080p Full HD Video with DTS-HD Master Audio for English 5.1. The 3-disc Blu-ray will feature a high-definition Blu-ray and a Digital Copy of all 17 episodes from Season Two. DC's Legends of Tomorrow stars Victor Garber (The Flash, Titanic), Brandon Routh (Arrow, Superman Returns), Arthur Darvill (Doctor Who), Caity Lotz (Arrow, Mad Men), Franz Drameh (The Flash, Edge of Tomorrow), Maisie Richardson-Sellers (The Originals), Matt Letscher (The Flash), with Nick Zano (The Final Destination) and Dominic Purcell (Prison Break, The Flash). Based on the characters from DC, DC's Legends of Tomorrow is produced by Berlanti Productions in association with Warner Bros. Television, with executive producers Greg Berlanti (Arrow, The Flash, Supergirl, Blindspot, Riverdale), Marc Guggenheim (Arrow), Andrew Kreisberg (Arrow, The Flash, Supergirl), Phil Klemmer (Chuck, Political Animals), Sarah Schechter (Arrow, The Flash, Blindspot, Supergirl, Riverdale) and Chris Fedak (Chuck, Forever). Stay tuned on when LEGENDS' third season premieres later this year.